At the bottom is an inverted ball head. twisting the big knurled ring that circumnavigates the base tightens and loosens the ball. On top of that is a geared section that controls pitch and roll. On top of that is a ungeared platform for adjusting yaw. In the above picture, you can see the yaw and roll control knobs, one coming out of the head towards you, and one pointing to the right. You can also see the knob for locking the camera to the head. Note that the knobs all look similar. 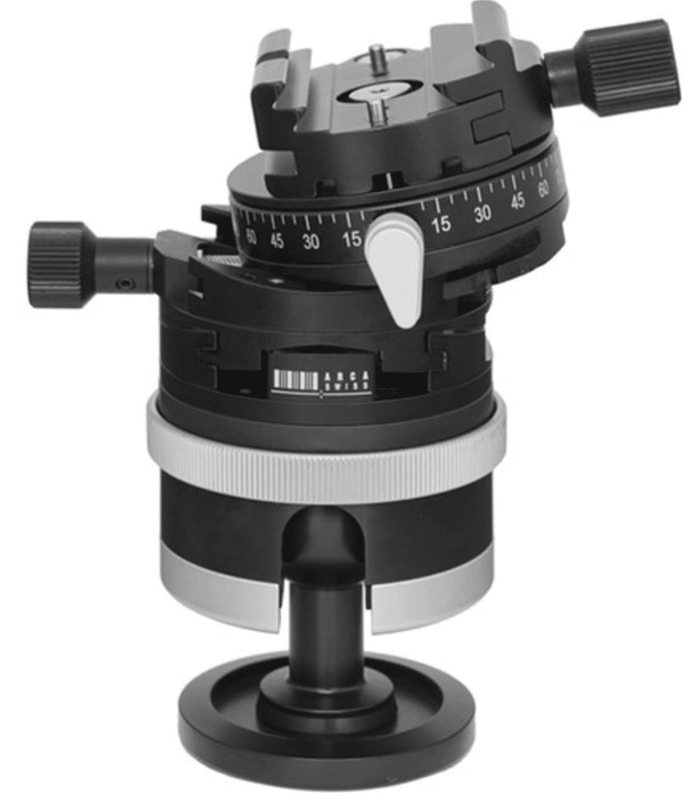 I can tell you that they feel similar, too, even though the knob that tightens the camera plate is slightly larger and the knurled section is longer than the roll and pitch knobs. You don’t want to get those three knobs confused. You especially don’t want to twist the knob that holds the camera in place while thinking that you’re adjusting roll or pitch, especially if you don’t have fast reflexes so you can catch the camera before it hits the ground. More on that in a minute. Now you can see the rounded triangle that unlocks the yaw platform. You’ll see that in both images above, the head is set up so that all four controls stick out in different directions, each having its own compass point as you look straight down on the head. I suggest that you set up your head the same way, and keep the knobs pointing in the same direction with respect to you every time you use the head, so as to minimize the possibility of confusion as to which knob is which. I set mine up with the knob that tightens the camera plate down pointing towards me. That way it’s the hardest knob to reach, and I can see the roll adjust calibrations from the back of the camera. Now look at the picture above, and note that the pitch axis (assuming you’re not using a lens with a tripod collar) is raised (or lowered, depending on which way the camera is mounted. I can tell you that it is raised as far as it will go, which is nowhere near as far as the extent of the geared movements in the C1. The practical implications of the limited amount of geared movement are twofold. First, you’ll want to center the geared axes every time you finish using the head so that you don’t run out of geared range the next time you go to use it. In this respect, you treat the head the same way you’d treat a view camera: always return the device to a known state when you’re done with a shot so you will know where it is when you’re setting the next one up (I don’t do this with the Cube, which has a much greater range). The P0 head provides indices to show you when the movements are centered; you can see the one for pitch in the top image above. Put the two dots on the two furthest ticks and you’re there. Why not center the movements just before you set up a shot? Because you’re much more likely to be in a hurry then. My biggest problem with the head is the lack of a yaw axis underneath the ball. The C1 has yaw both under an on top of the other two axes, and that is very handy. I’ve added a RRS panning base underneath my P0 Hybrid to get the same function that the C1 comes with, but that negates one of the great advantages of the P0 Hybrid: its small size and light weight. I’d give it a B, or maybe a B+. It’s certainly better than a ball head for what I do, and it is faster and — I expect — more rugged than my C1, even if it’s not lighter with the panning base added. Curious why you don’t like the d4? 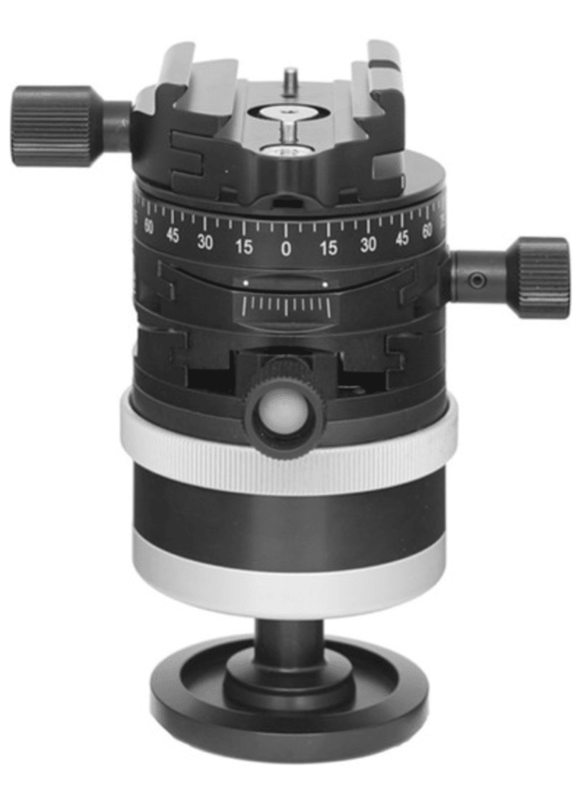 I use one on a tall Series 3 Gitzo under the Actus and find it offers good functionality are a bit lower size, weight, and cost than the C1. I didn’t like the feel of the geared controls on the D4, or their location. If it were the only head I had, I’m sure I could have made friends with it, but it was so different from the C1 that I found it frustrating to use. I have one of these on my wish list. I have a normal p0, but I would really love the precision of a geared head, especially for adjusting roll about the camera axis. My biggest issue is the diameter and height of the post. We all know extending a center column is not the best thing to do, and this is like permanently extending a skinny center column 1.5″. Seems good for my Sony A7rII, but the technical camera doesn’t work in just a bit of wind. Compared to the BH40 bullhead (which is nothing beefy), it is twice as tall and 2/3 the diameter. I echo the wish for a panning base; you can’t swing a lens around for even “cheap” panos without a panning function that is level. I’m not sure why they have the detents, both on the top pan and on the zero pitch /roll. The only time those are useful is if you have the head oriented exactly level and square to your target. It is usually at least a little off kilter, so to me the detents just get in the way. Also agree with your B to B+ grade. On the whole it is both fast like a bullhead and accurate like the cube, so in that regard it is a success. I wouldn’t worry about the stiffness of the ballhead itself, the problems there come from the tripod pivoting about the spider, not the ballhead flexing. I don’t think the pitch/roll axes have detents, only the pan axis. The pan axis detents are probably useful so you know that pitch and roll are precisely pitch and roll, not linear combinations of pitch and roll. That is correct. I’m calling the pan axis the yaw axis. That is correct, but the usefulness is only important to me if I’m using the pitch and roll axes to level the top platform. I didn’t get a useful range of motion out of it, and I found the locking mechanism unreliable.